(Newser) – One-time Republican presidential candidate and current Wisconsin governor Scott Walker thinks there's a good chance that the nominee who comes out of the July convention won't be Trump, Cruz, or Kasich, the Capital Times reports. "I think if it’s an open convention, it’s very likely it would be someone who’s not currently running," Walker says, though he later acknowledged that "almost every prediction’s been off, so it’s hard to predict anything." 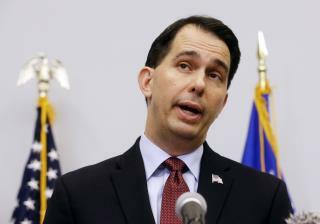 Fortune sees Walker's comments as a way for him to keep his presidential aspirations alive. He was briefly the GOP frontrunner before dropping out of the race in September. THAT happens and some one who is not even on the campaign trail; there will be holy hell to pay by these now overt and clearly corrupt politicians. ALL that would do is create allot of now "independents" in the race. Trump 2016, make America HATE again, not doing well enough to guarantee nomination! Don't stay silent, speak up & speak out now. He must be stopped now. Even his own party doesn't want him!!! Trump is going to the WH.